Gorgeous preening birds that approach on stick legs with eyes wide and appetites whetted, gingerly accept the hand that feeds their regular snack of bread and seeds. This was our first experience after passing through the main entrance of Neo Park in Nago. Some of these exotic birds, such as the Crested Crane, stand as high as my young sons and sport regal plumes of feathers atop their heads, resembling a native headdress. These tall ones compete for attention with scores of flamingos who, throughout the park, range in color from pastel pink to fluorescent orange. Stylishly marked in black and white, a group of birds named the Sacred Ibis, were quite prevalent in the Flamingo Lake area. My boys loved it when the bold ibis clan followed close behind us for a while, squawking their demands for more bread tidbits. Rounding another corner we saw the first of many types of monkeys we would see that day. Black-handed spider monkeys sat freely in low trees, completely accessible to accept the snacks from our outstretched, flattened palms. Gingerly they took our offerings, wrapping the food up in their tiny fists and then brought it to their mouths. The munched away as they watched us with mild interest while we in turn totally relished watching them. Next we strolled beneath an glass arch walkway that displays overhead many types of fish, big and small. Asphalt pathways wind throughout the park, marking the way for visitors without greatly disturbing the feel of natural woods that lead to numerous ponds and open grassy areas. As the walk ensues, exotic shrieks are heard from animals native to Africa and Australia, as well as Asia. One of my family’s favorite sections showed to our surprise two types of free-hopping Wallaby, naturally assumed to be “baby kangaroos” by my younger son. This section was netted on top to keep in the free-flying birds and scores of fruit bats that hung watching us from above. Odiferous Rheas and Emus were found here, as well as an interesting large, turkey-like bird named the Double-wattled Cassowary. In the next section I was thrilled to come close to a group of big, glorious peacocks. A couple of amorous males displayed proudly their breathtaking plumes that spread at least six feet from side to side. Turning slowly, they stately showed off for the unadorned females, the beauty of their physical features, and thus their ability to produce enviable offspring. As we left I was amused to see a female beginning to engage in her counterpart dance with a suitor, ensuring another coming season of peacock chicks. 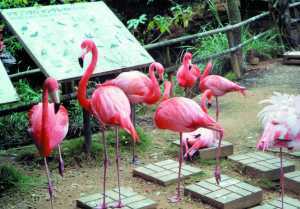 There are scores of different animals at Neo Park that are too numerous to mention in this brief review. 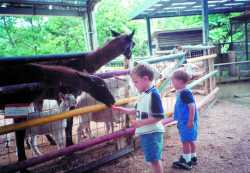 In one section, small children will love feeding the penned goats that seem to inhale carrot sticks made available for visitors. Further on several different types of lemurs rule their own little islands that dot a small lake. In this mid-point area, a cute cafe offers snacks, drinks, and a relaxing patio which overlooks the lake. Probably the favorite feature for my boys was a giant tortoise corral where they were invited to ride for a moment on the giant shells of these intriguing, slow movers. There were at least 20 South African tortoises here that I was told can live to be 200 years of age. 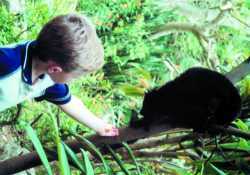 Visitors can get close to touch these animals and watch them closely as they walk, drink and munch the leaves of cut shrub branches. At Neo Park, visitors can stroll easily for a couple of hours while coming in intimate proximity to exotic birds, monkeys, reptiles, hoofed animals and assorted creature surprises. The park grounds are far from bright and shiny but seem to be adequately kept up while offering an easy stroll through natural gardens, woods and walkways. To get to Neo Park, take the expressway until it ends, then follow 58 until you get to Nago. Along the way, be sure to relish the beauty of the route as it winds and hugs the base of mountains on one side of the road and looks out over rocky shoreline on the other. When the highway forks, just past central Nago, veer to the right, staying on 58, rather than heading left towards Motobu. Continue on 58 for a few minutes, passing a busy retail section until you see a large Makemon center on your left with a Mos Burger in its parking lot. Just past there, at the next traffic light, you will see a high arch that displays the name of the park; but only in Konji not in English. There is an expansive, free parking lot leading to the entrance which first has visitors pass through a large gift shop featuring all types of Okinawan souvenirs. Entrance into the park is ¥630 for adults and ¥315 for students while tots, three and under, get in free.